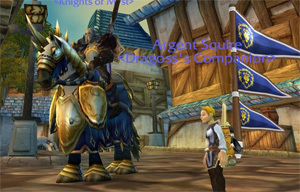 Daily quests are an important part of World of Warcraft, especially if you have any of the professions that require daily quests. Jewel crafting, cooking, and fishing all have daily quests for you to do, and there are important benefits from completing these daily quests each day. The daily quests for cooking are the only way to learn certain recipes, including the recipe for fish feast, which is the one everyone always brings on raids. The fish feast increases attack power and spell power, which means it has a beneficial aspect for all raid members. There are daily quests for cooking in both Shattrath and Dalaran. The Shattrath dailies can drop certain recipes from the Barrel of Fish or Crate of Meat, which are given as rewards for the daily quests. The Dalaran cooking dailies reward you with 1-3 Dalaran Cooking Awards or some extra spices. The Dalaran Cooking Awards are used to purchase additional recipes. The Small Spice Bag reward also has a chance to drop additional rare recipes. The fishing profession is paired best with cooking because you can get many of the materials you need for the recipes by fishing. You can pick up the daily quests for fishing from the fishing trainer in Dalaran, who is located near the fountain in the Eventide area. There are five different daily quests for fishing, and they may change every day, although they will be the same for everyone on your server. The reward for completing daily quests for fishing is a Bag of Fishing Treasures, which can drop everything from trash to epic gems. Just make sure you remember to sell your trash from this bag because some of those junk items are worth a decent amount of gold. The daily quests for fishing are a great way to earn some extra gold, especially if you are lucky enough to get an epic gem from your reward. The daily quests for jewel crafting are available from Timothy Jones, the jewel crafting trainer in Dalaran. He’s located in the Magus Commerce Exchange, and there are six different jewel crafting daily quests he may offer you. The rewards for jewel crafting dailies are tokens which can be used to buy more jewel crafting designs. Another important aspect of running daily quests for jewel crafting is reputation. There are several factions throughout the game that offer epic and rare gem designs. These designs can only be purchased by characters that have enough reputation with them. Running daily quests for these factions will help earn enough experience for jewel crafters to become eligible to purchase these epic and rare designs. Another way to earn reputation is by purchasing a tabard from the faction you want to earn reputation with. Just wear the tabard while you’re running dungeons, and you’ll earn reputation for that faction from each kill. However, you must be at least friendly with the faction before you are eligible to purchase the tabard from it.